Awakened by Russia’s conflict with Ukraine, the Baltic countries are trying to figure out how to win the hearts and minds of their Russian minorities who are lured by Russian TV channels with seemingly endless federal financing. The worried Western allies are stepping up funds for journalist training and Russian-language programming, but there are more undercurrents to tackle in the Baltics, reaching beyond providing more and objective information. The three Baltic countries – Estonia, Latvia and Lithuania – were among the first in the European Union to ring the alarm bells about manipulative messages slithering through Russian TV channels, which are widely popular among their Russian speaking populations. The Baltic countries have the biggest Russian minorities in the EU as percentage of their population. 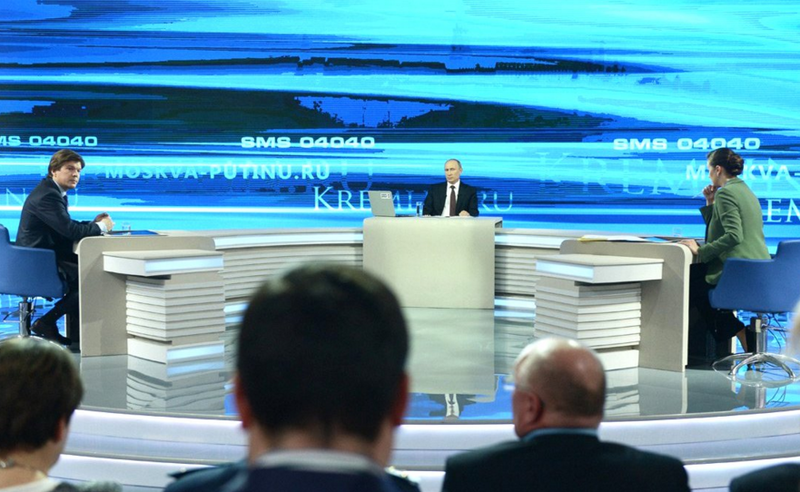 In the Baltics, it is a fact known for years that Russian speakers watch Russian TV channels, not local. It has also been common knowledge that information presented by those TV channels might not always be considered fair journalism. At the same time, until Russia’s annexation of Crimea in March, 2014, Estonians, Latvians and Lithuanians have cared little what Russian TV channels were broadcasting and what their neighbors were watching. Balts and Baltic Russians have been living in parallel information universes for over two decades. From time to time the issue was raised over how to reach and speak with Baltic Russians, yet no relevant actions followed. Most Popular TV Channels in the Baltic Countries in 2015. Data: TNS LT, TNS Latvia, TNS Emor; Share, % – share of viewing, the percentage of the total viewing audience watching over a given period of time. Period – 01.01.2015-30.09.2015. Channels in Russian language marked in yellow. It all changed in the beginning of 2014, when the “little green men” crossed Ukraine’s border and within less than a month Russia annexed Crimea. Baltic politicians condemned the events in Ukraine and accused Russia of spreading disinformation about the conflict on its TV channels. Lithuania’s president Dalia Grybauskaitė said Lithuania and other countries were subjected to an open information war and “we ourselves have to develop resistance to the propaganda machine”. While then defense minister, now the president of Latvia, Raimonds Vejonis said that Russia might try to increase negative sentiment in Latvian society and stir unrest through “certain specially-trained, professional provocateurs”. Fuelled by the failure to make Russians a part of the local communities after the restoration of independence, politicians’ fear of their big neighbour fomenting unrest in the countries seems plausible. Each country has taken steps to try to limit the influence of Russian TV and to provide alternatives. Still little has been proposed to promote a dialogue with the Russian minority. The perception that Baltic Russians are aligned with Russia and under the influence of its TV channels is widespread. Yet, rarely their voices and needs are heard. The events in Ukraine marked a turning point, forcing a reevaluation by European and U.S. politicians of the power wielded by Kremlin-aligned media over Russian speakers around the world. In addition to the federal TV channels, like, Россия 24 (Russia 24), Первый канал (the First channel), НТВ (NTV), Russia is expanding state-controlled RT (formerly Russia Today) in a multi-language media platform. A year ago it created the global news agency Sputnik. 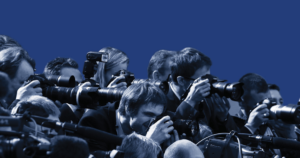 “Much of the television news broadcast from Russia has exhibited a growing tendency to sensationalise, simplify, distort, co-opt and marginalise issues in ways that run counter to the universal values of fair and accurate journalism,” the European Endowment for Democracy (EDD) said in the summary of its feasibility study on “Russian Language Media Initiatives in the Eastern Partnership and Beyond” . It was commissioned by the Dutch government, with Latvian government assisting, to assess what can be done to counter Russia’s propaganda. While the first reaction that comes to mind might be to strike back with the same weapons, it’s likely to fail as there is a consistent lack of trust in most media outlets already now, according to EDD. As the West is calling Kremlin backed media propaganda, Russian speakers consider this message and any attempts to counter it Western propaganda. Nevertheless, the EU has created a small group of experts under the European External Action Service to respond to the challenges of “Russia’s ongoing disinformation campaigns”, but it’s work will be mostly focused on myth-busting on social networks. The EDD is proposing to create a news hub and content sharing platform to encourage the production and distribution of news and TV programs in the Russian language focusing on content that reflects local issues. Poland has pledged to support the EED’s initiative with 1 million euros and the Dutch government has pledged 1.5 million euros for a news exchange to bolster Russian language news agency . The US State Department has commissioned the University of South Carolina’s Newsplex Initiative and the New England Center for Investigative Reporting to create an investigative journalism training program in the Baltics for $500,000. Suddenly, money is pouring into media that have been struggling financially for years and who lack resources more for content-production than they lack training. It took more than 20 years and events in Crimea to finally nudge Baltic leaders to see the risk of not having their Russian minorities engaged in the local community. It is a vulnerability that can be used against them. Earlier it was concluded that there was a need to provide an alternative source of information, preferably a TV channel, for the local Russian speaking audience. The half-baked idea to create a joint European and/or Baltic TV channel in Russian language surfaced, but quickly sank. Each country decided to go its own way. 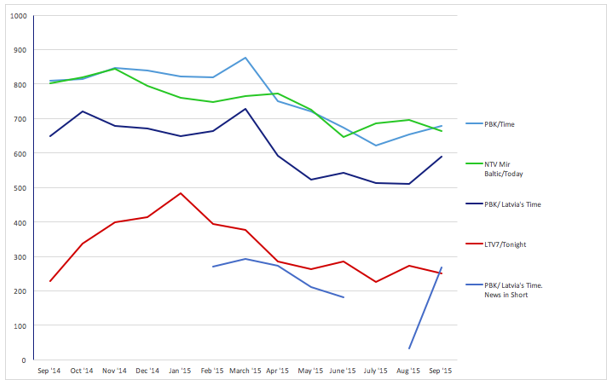 Comparison of Share of Viewing of Russian TV Channels in the Baltics. Data: TNS LT, TNS Latvia, TNS Emor; share, % – share of viewing, the percentage of the total viewing audience watching over a given period of time. * Since January, 2015, TNS LT is not measuring the audience of RTR Planeta; it does not mean that people are not watching it. Estonia opted to create a new TV channel in Russian, ETV+, under the Estonian public broadcaster ERR. “The role of Russia and the role of Russian ruled media in the world changed during the last two years. All Western countries, including Germany and US, are more worried about the information, which is coming from Russia. And, of course, what happened in Ukraine was one important thing why the Estonian government, as well as the Latvian government, started to discuss [the need for] the Russian language multi-media channel,” said Ainar Ruusaar, a member of ERR’s board. Created in nine months, the channel’s running costs are estimated at around 4 million euros per year as it aims to produce 24 hours of original programing a week, including news. Almost 100% of the money for the new channel this year came from Estonia’s state budget. In addition, ETV+ received some small financial help from mostly Nordic countries to launch the new channel: to train journalists and do some marketing activities, says Ruussaar. The channel focuses on telling local stories about life and opportunities in Estonia. ETV+’s vision includes not only the creation of TV content, but also the use of multimedia to reach different audiences. Before it even went on air, ETV+ drew wide attention, including that of critics who say its programs will not be able to compete with the grandiose productions of the Russian federal TV channels, or that it will be a TV channel spreading Western propaganda. Ruussaar stresses that from the very beginning it was clearly stated that ETV+ would not be an anti-Russian propaganda channel. As a guest on one of the ETV+ shows on the third day of broadcasting, Ruussaar joked that journalists get lists of people to be interviewed in North Korea, but there were no blacklists in Estonia. “We live in an independent country and we create an independent TV program,” Ruussaar said. As Russian TV channels don’t report local issues, ETV+ should be able to compete with them in the future, says Ruussaar. The new channel is on air from September 28, 2015. Funnily enough, more Estonians than Russian speakers watch it; after the massive discussion on its merits in Estonian media it is understandable. During the first week of broadcasts 294,000 people older than 4 years or 24,2% of population watched the channel for at least a minute ; of them 217,000 people or 25,7% of the audience reached were Estonians, while 77,000 people or 20,7% were of another ethnicity. “Now the reality is that about 200,000 people weekly watch ETV+ more than 15 minutes and half of them are Estonians. But, of course, it is a long term project. Our target is that by next October half of Russian speakers in Estonia will watch this program more than 15 minutes weekly and 55% will know that here is a TV channel or multi media channel named ETV+. It is our huge task,” says Ruussaar, who remains optimistic. Latvia also toyed with the idea to create a public TV channel solely dedicated to Russian-speakers, yet it did not come to life for several reasons. While there was a political support for a joint Baltic TV channel, there was none for a local one. The nationalist party who is represented in the government, VL-TB/LNNK, feared that the creation of such channel just for Latvia will demotivate Russian speakers to learn Latvian. “Another reason was that we did not feel a strong support from the audience of Russian speakers. Apparently, they perceived this idea not like a channel that would be created for them about local topics, something that had to be done already 20 years ago, but as another attempt to brainwash,” says Olga Proskurova, the editor in chief of Russian content unit with the public broadcaster’s LTV news service. Politicians did though have a strong urge to do something and allocated money to increase the number of Russian language programs on the public broadcaster LTV. Data showed that it was news that was steadily attracting Russian language viewers, but local TV channels had 10 times less Russian language news programs than those of the rebroadcasted Russian federal TV channels or their local offsprings. Therefore, a year ago, in September, 2014, morning and evening news programs and three analytical programs totaling 12 hours of original Russian language content per week were introduced. In the first month (September 2014) the evening news were watched at least for a minute by 227,800 people older than 4 years or 11,5%, the monthly reach of a discussion program was 153,300 people or 7,7%. The reach of the other shows was below 100,000 people. “I cried when I saw the ratings of the first programs. But we grew fast and the ratings in January, 2015, were the best we had reached. We were really happy that people are watching us. Our competitors also understood that we are growing and in February PBK introduced short local news at the time when we had our evening news. It hit us really hard and our ratings again started to fall. But we don’t give up, we continue to work,” says Proskurova. In January, 2015, 483,800 people or 24,3% of the population watched local Russian language news on the public broadcaster at least for a minute. 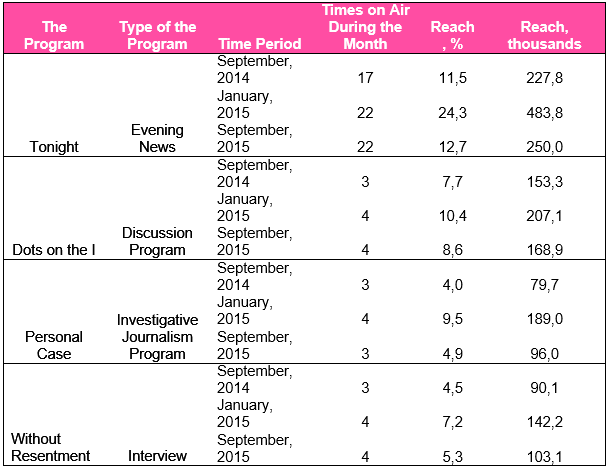 PBK news attracts two to four times more viewers than those of the public broadcaster. In the new season (from September 2015) the morning news program was dropped. Instead a new program before the evening news was introduced, giving a reason for Russian language speakers to turn on TV in the evenings for a bit longer. The Russian language programs total 9 hours per week, which is 25% less than in the previous season. The reach of the Russian language programs on the public broadcaster have increased. In September 2015 compared to the same period a year ago, the reach of news and discussion shows increased by 10%, the reach of the interview program grew by 14%, but the reach of the investigative journalism program increased by 20%. Changes in Latvian public broadcaster’s Russian-Language Programs’ Reach Data: TNS Latvia; Reach, thousands – total number of population that have watched a program at least for a minute during given period of time. Comparison of Russian Language News Reach (in thousands) on Various Channels. Data: TNS Latvia; Reach (thousands) – total number of population that have watched a program at least for a minute during given period of time. Proskurova still believes that a separate channel is needed for the Russian language audience, but the chances of such an outcome are unlikely. “We can only continue to work and improve the quality of the programs we make. We do have ideas that we should expand to internet, but those are only ideas at the moment,” she says. Other efforts to provide better journalism include the idea to set up the Baltic Centre of Media Excellence which would act as a one stop shop for all media training needs, as the region is suddenly awash with trainers and money to spend on them. The idea is supported by Latvia’s Ministry of Foreign Affairs, who have awarded a grant for training journalists in the EU’s Eastern Partnership countries, and Nordic countries, who have been looking for the least controversial ways to strengthen Baltic media. The Centre was formally established in Tallinn, in November 2015, and the founders were broadcasters and professional organisations representing all media segments from the Baltic countries. Lithuania has the smallest Russian speaker population among the Baltic countries and Russian channels get half of the share of viewing time compared to Latvia and Estonia. However, it is Lithuania that has made the loudest international headlines suspending broadcasts of several Russian federal channels in its territory due to their coverage of conflict in Ukraine and Lithuania’s history. The Radio and Television Commission of Lithuania (LRTK) placed a temporary, three-month suspension of programs produced outside the European Union and broadcast on Russian-language TV channels Ren TV Baltic, NTV Mir Lithuania and PBK. In April, 2015, LRTK completely banned the rebroadcasting of RTR Planeta in Lithuania for three months. LRTK explains that it has taken these decisions because particular broadcasters breached Lithuania’s law and disseminated disinformation which is forbidden by its laws. “Naturally, the goal our Commission achieved by suspending those programs was that it stopped incitement to hatred, instigation of war, spreading of disinformation and violation of Lithuania’s laws,” says Birute Kersiene, head of public and international relations at Lithuania’s media regulator. Opinions differ whether bans are an effective way to solve the problem of Russia’s disinformation campaigns, but Lithuania is demonstrating it will not let hate speech or Lithuania’s history distortion on Russian TV channels slip away unpunished. Data shows the share of viewing of Russian-language TV channels has diminished during the temporary bans. Yet, once they are lifted, viewers return to their favorite channels. Comparison of TV channel Share of Viewing Before and After Imposed Bans. Data: TNS LT; Share, % – share of viewing, the percentage of the total viewing audience watching over a given period of time.Temporary suspension of some programs on a particular channel marked in yellow. The complete ban of channel marked in red. *Share of viewing of the TV channel was so low it was not specified **Since January, 2015, TNS LT is not measuring the audience of RTR Planeta; it does not mean that people are not watching it. The procedure of suspending either parts of programs produced in Russia or the whole channel had to be taken in accordance with European and Lithuanian laws, since legally Ren TV Baltic and NTV Mir Lithuania are registered in the UK and accordingly operate under UK jurisdiction, while RTR Planeta is registered in Sweden and PBK – in Latvia. Lithuania got a boost for its actions as European Commission said in July that measures taken by Lithuania against RTR Planeta were not discriminatory and were proportionate with EU laws to ensure audiovisual media services do not contain any incitement to hatred based on race and/or nationality. Lithuania also has alerted colleagues in OFCOM, the British regulator for communications industries, about the broadcast content of some programs on NTV Mir Lithuania and Ren TV Baltic, and they’ve concluded on several occasions the content was in breach of the British Broadcasting Code. From October 1, 2015, amendments to the Law on Provision of information to the Public, initiated by Lithuania’s president Dalia Grybauskaite to counter hostile propaganda, have come into force. Lithuania now can fine broadcasters and re-broadcasters with a penalty of up to 3% of their annual revenue for publishing war propaganda or information inciting the change of Lithuania’s constitutional order through the use of force, instigating attempts against Lithuania’s sovereignty, territorial integrity or political independence, or for publishing information that incites war or hatred. In her state of the nation address in March 27, 2014, Lithuania’s president Dalia Grybauskaite called all media owners and managers, journalists and columnists to help Lithuania’s residents “to distinguish lies from truths, to inform society very clearly about the intents directed against our state, and to counter the misinformation and the propaganda of hostile forces”. Either because of it or not, but some of Lithuania’s media is actively promoting the military. To introduce the audience to the methods used in the Russian propaganda coverages Lithuania’s public broadcaster LRT was considering a separate program. In the end, though, it was decided not to have a special “anti-propaganda broadcast, as anti-propaganda is very close to propaganda,” LRT chief Audrius Siaurusevicius told BNS in August 2015. “However, we want our content to deconstruct this,” he added. According to Siaurusevicius, currently LRT is airing Russian language broadcasts produced by other parties, for example, German broadcaster Deutsche Welle, Radio Free Europe and the Voice of America, the first one being funded by the German government, but the latter two – by the US. 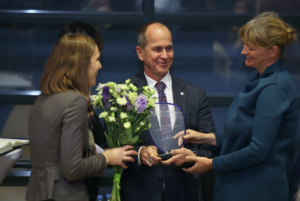 To improve strategic communication, in 2014 NATO Strategic Communications Center of Excellence was opened in Riga. The mission of the Centre is “to contribute to the Alliance’s communication processes in order to ensure that it communicates in an appropriate, timely, accurate and responsive manner on its evolving roles, objectives and missions”. Yet, the first public conference organized by the Centre on August 20-21, 2015, left journalists with nothing as they were allowed only in a designated area, but not allowed to chat with the speakers and participants on the sidelines of the conference to get a better grasp of the strategic communication challenges and the centre’s tasks. Meanwhile, Anda Rozukalne, associated professor of Riga Stradins University, is concerned that most of the discussions on how to deal with Russia’s disinformation campaign do not involve the Russian audience. “I’m worried that a feeling is created in this discussion about the smart “us” and “them” – Russians under the influence of propaganda. But there are as many critically thinking individuals in the Russian audience as among Latvians or other balts,” says Anda Rožukalne. While a new TV channel in the Russian language might not be the magic wand to solve problems the Baltics are facing to unite their populations of various ethnicities, it might be a step forward. The new Estonian channel will provide a platform for Russian-speakers to express their thoughts and be heard, something they have lacked before, says Ruussaar. ETV+ editor-in-chief Darja Saar has said that the channel should be regarded as a long-term social project aimed to engage Russian speakers in Estonian social life and strengthen the country. “The concept that you have to first learn a language and then you can participate in the social life – the experience of the last 20 years shows that it does not work,” Darja Saar said in an interview to Latvia’s public radio. Her counterpart in Latvia, Olga Proskurova agrees. “I’m really sorry that in Latvia there is no support from the Russian-language audience itself. The demand for such a platform should first come from ourselves, because we have to learn to live in the local information space. We don’t know how to do that,” says Russian speaker Proskurova.